So guess who Marcus and I got to meet this weekend? The culinary sorcerer himself, Chef Ferran Adrià, the former chef of the now-closed, world-renowned, modern gastronomic restaurant, elBulli! The new cookbook released by the chef, in summary, "chronicles the restaurant's famously thoughtful staff meals." Chef Adrià dropped several hints on what the premise of this cookbook during his conversation with Adam Gopnik at the 92Y when he was in the States last March. This included that for elBulli's staff kitchen meals (aka "family meals"), the challenge was putting a limitation of the amount to be spent on ingredient while at the same time being able to create a good, solidly tasting meal. 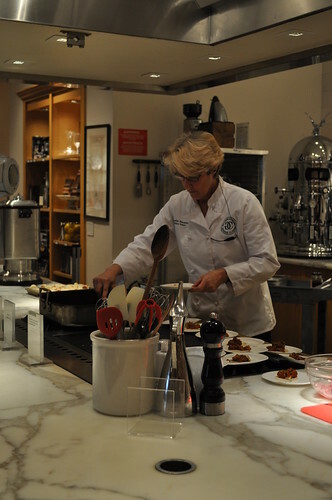 He also noted that the typical four servings seen in most cookbook recipes don't accommodate the varying parties that are usually found cooking at home (i.e., singles, doubles, families with kids) -- with this in mind, the actual recipe needed may require less portions and/or a completely different meal structure. After casually perusing the pages of The Family Meal, Chef Adrià hits the nail right on all these points. It appears that ingredients are relatively easy to obtain and there's a handy matrix for the amount of people for whom you'll be cooking (i.e., for two, for six, for 20, for 75) and the ingredients' respective proportional measurements. So not only does this book have Chef Adrià's gastronomic influences throughout its pages, it's practical, relatively simple in directions, economical, and perfect for the meals I prepare at home now with Marcus in our new place together. Also, there is no worry about having too much left over and have it go to waste. As the signing was to begin at 3 PM, Marcus and I made it a point to get there about an hour before. We were running a little late, so we got there around 2:15. This was the view of the line from where we ended up standing in line. 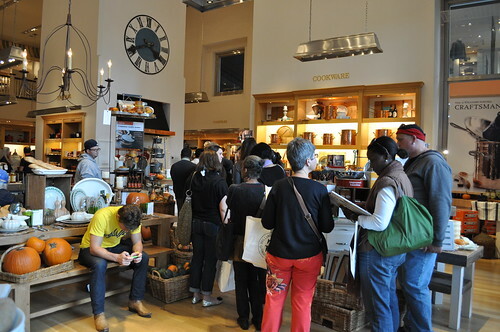 Not too bad, I thought, from my previous experiences at Williams-Sonoma book signings. 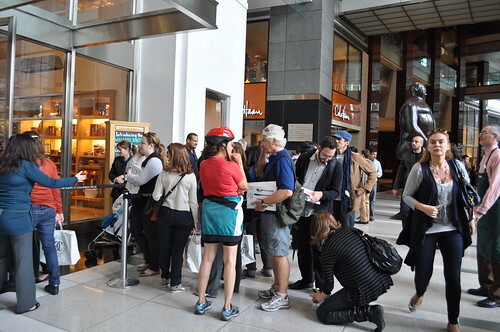 I estimated it to be about a 15-20 minute wait in line, depending on the parameters of the signing (posed photos permitted versus photos as the chef is signing, custom personalizations with an inscribed message versus just a written message, etc.). 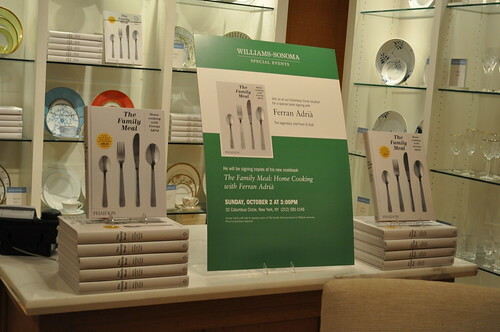 While the book signees were waiting in line, the Williams-Sonoma kitchen prepared two sample recipes from The Family Meal. One recipe was the coconut macaroon (page 126) -- not to be confused with Parisian/French macarons -- and the other was Mexican-style slow-cooked pork (page 214). 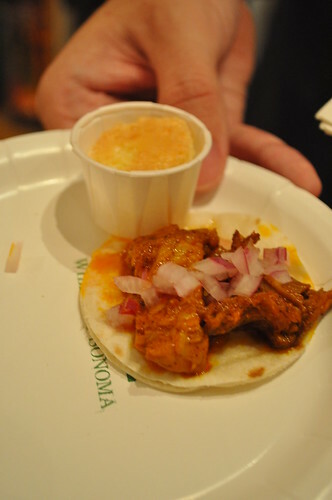 The pork was served over a miniature tortilla and topped with minced red onion -- overall, it was very flavorful, soft, and juicy. Ahhh, would love to try to make this recipe at home! The coconut macaroon was lightly sweet and very coconutty! Chef Adrià and me! Such a nice guy -- really funny, too! Since he doesn't know much English, he kept giving Marcus the thumbs up to make sure we got the photo, saying, "Good? Good?" 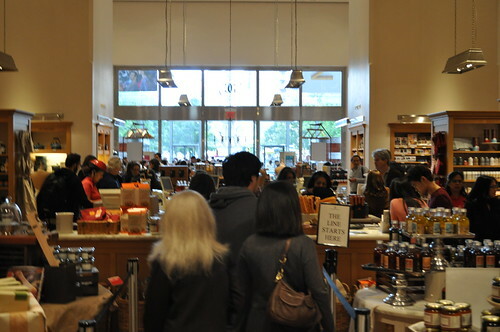 You can see the line creeping out the door, as we were able to leave, and the line of people waiting to purchase copies of the cookbook right in front here. 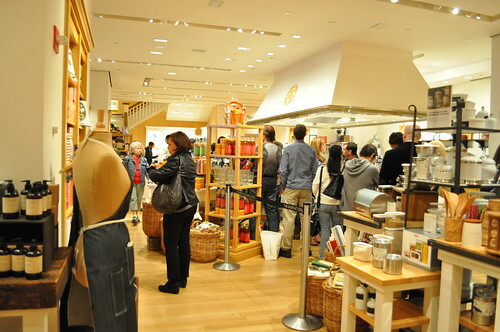 Per usual with book signings at the Williams-Sonoma Columbus Circle location for famous chefs, the line curves around the store as eager foodies wait (im)patiently to meet the said chef (Chef Adrià today, of course). And almost always, the line is out the door! My copy of The Family Meal! 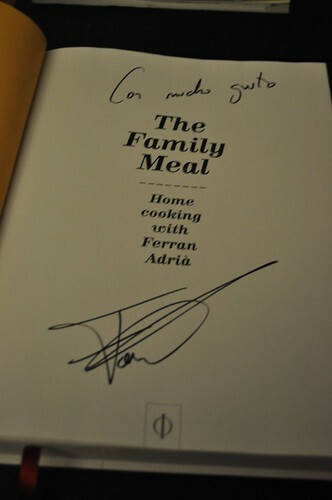 Chef Adrià's kind words upon signing the cookbook: "Con mucho gusto" -- Spanish for "with much pleasure." Findings: It was really nice to finally meet Chef Ferran Adrià in person, especially after seeing him speak at the 92Y back in March and being unable to meet him after due to books being sold out. And what an awesome chef's cookbook (a signed copy, no less) to add to my eclectic collection of cookbooks! I also love the structure of his cookbook in that it appeals to the everyday person -- one with a budget, relatively limited resources (i.e., what is found at an everyday grocery store), household of one or many, and somewhat of a time crunch. 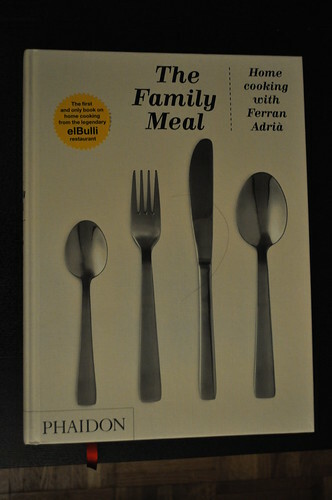 Chef Adrià addresses all of these issues in The Family Meal, which is something that I've been on the search for in a solid cookbook. I can't wait to explore this cookbook (yay for recipes that address two servings!) during the nightly meals that Marcus and I cook together during the week, after a long work day. Lastly, how cool is it that I have a photo with Chef Adrià?! I'm still very starstruck about it. Price point: $29.95 for each book.